Hi there! It has been two weeks since our last devlog and we have quite a lot to share today. We've laid some parts of the ground work needed for custom library implementation, and also finalized some specification about how it will work once it's released. 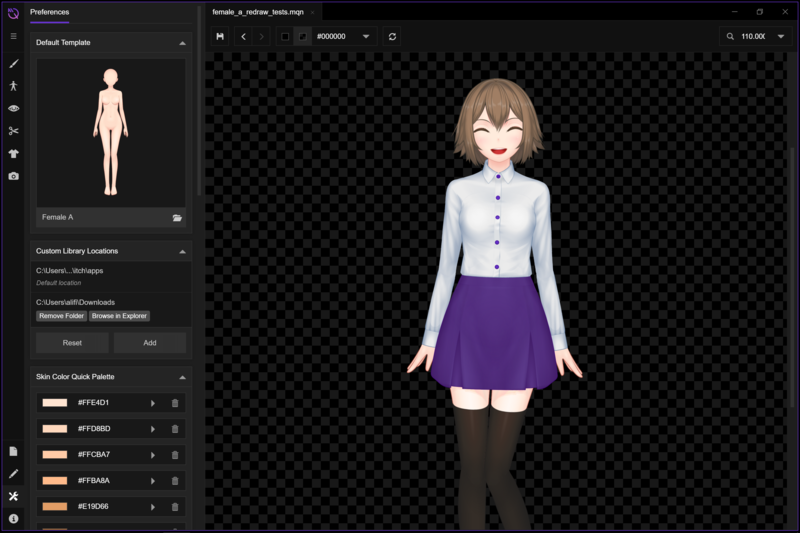 Some minor tweaks in the UI which are unrelated to this aspect are also available, and last but not least, another slow but steady progress towards revamped art style for default female template. After thinking quite a bit about the best platform for distributing custom libraries, we decided that using the itch.io app itself looks to be the most simple and user-friendly for now. When distributing via itch.io, you'll have easier time pushing updates to your custom library content and also be able to sell your creation should you wish for it. So, here's the basic concept of how custom libraries will work. A custom library folder will consists of three main folders, similar to the built-in library. Those folders are components (for storing SVG files), configs (for storing JSON files), and thumbnails (for storing PNG thumbnail files). We won't go into the detailed specifications of the files inside these folders for now as it's still not finalized yet, but you can always have a look around into the built-in library folder to get a rough picture about how all of it works. When distributing via the itch.io app, you can just upload the entire folder. When it is downloaded by an user, it will be stored in a specific folder by the itch.io app, for example C:\Users\yourUserName\AppData\Roaming\itch\apps on Windows. Mannequin will have this directory hard-coded as a default location in which it will search for custom libraries. When it found a folder with appropriate structure like the one shown above, it will automatically add the custom library so the user can use it. As you can see on the screenshot above, the Preferences sidebar now have a section for adding Custom Library Locations. From here you can add various folders to the list, in which Mannequin will search for a valid custom library similar to how it will search inside the default location. By using this method, an user can just download a ZIP file which contains the custom library folder, extract it anywhere, and then add the folder to the above list. So that's the rough explanation about how custom libraries will work. Expect these features to come in several weeks as part of the 0.3.0 release. We'll share more information regarding this as we're moving closer to the release day. Now you can disable component caching and adjust the number of render processes via Preferences sidebar. The caching options will be quite useful when you're in the process of making a custom library, since when caching is enabled, changes that happened into the SVG file won't be loaded by Mannequin as long as the file is still stored in memory. By disabling component caching, you can make sure that the app always loads the SVG file from disk when it redraws the character. 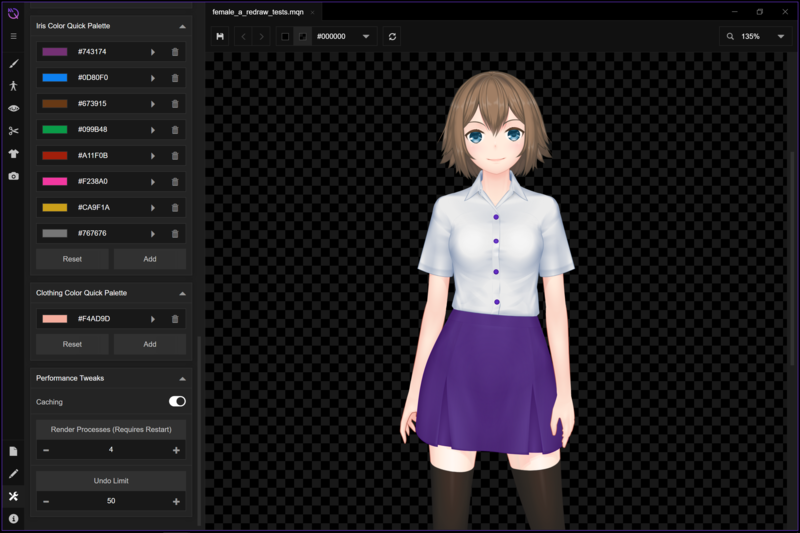 Lastly, or progress of redrawing the default female template clothing is still in progress. It's rather slow (definitely slower than expected) but the results are quite nice, as you can see from the above screenshots. With this pace, we think that the fastest time possible for these redraws to be finished is at least two weeks. We'll try to do better however we can, though. Anyway, that's it for now! As usual, huge thanks to all of you who has supported this project, and don't forget to say hi to us via Twitter. Also, as we're approaching the end of Ramadan, we would like to say Happy Eid-al-Fitr to all Muslims in the world!